Bell tents, yurts, pods, safari tents… we love glamping more than anyone, but with so many sites about it's hard to stand out from the crowd. If you're on the lookout For something truly unique then you've come to the right place. Take a browse, pack the car and try a night in one of these quirky hideouts – true individuals in the world of glamping. 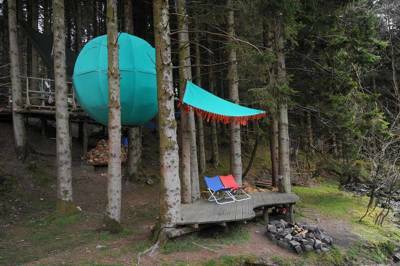 Suspended in the trees like a giant green orb, Red Kite Tree Tent has a remarkable design and one that's not only cool and unique but also deeply luxurious. Inside a main support pole is a shiny centre piece, surrounded by a plush double bed and a cosy wood burning stove, while outside the sweet smell of pine trees is inescapable and the babble of a stream below only accentuates that secluded, wilderness feel. Converted into a luxury pad with no fewer than three bedrooms, the 1981 Leyland Atlantean bus at Pigeon Door offers glamping with a difference. Downstairs the bus has been converted to include a kitchen and dining space, while upstairs there's a cosy top-deck sleeping area, complete with stunning views across the Stretton Hills. If that's not enough there's even a steamy hot-tub outside. This is one bus you won't mind being stuck on! Originally intended as sweet little places for changing into a swimsuit, the 365 beach huts crammed along Mudeford sand spit are now an overnight offering for family glampers. A peaceful haven this is not, but it’s a loveable one all the same. Only a small number of the huts are for hire and what they offer can vary, so do your research before picking a particular one. Some are extremely chic, while others are decidedly shabby, but the variety of colours is fabulous. Somewhere between pub, village hall and your best mate's living room, a night below deck aboard the Boy John is one to remember. The old fishing vessel, with a paino and sofas downstairs, sometimes acts as a lively communal space but, upstairs, couples can also take captaincy of the ship, kipping in the cabin where a double bed offers quirky, glamping accommodation. Beyond stretches the wildlife-brimming Defi Estuary while behind, Snowdonia awaits. Once the practical cabins for hop-pickers on the Kent Weald, The Hopper Huts at Little Halden Farm have been tastefully converted into cosy glamping hideouts. From the outside they look like a cross between horses' stables and a shepherd's hut, while inside they are kitted with the likes of double beds, wood burners and a 3-ring gas stove. The south-facing slope of the field means they’re blessed with the best of the sun and beautiful views towards Tenterden. In the heart of East Sussex, Blackberry Wood is a long-standing Cool Camping favourite and a well-established campsite, but its off-shoot of glamping offerings are quirky to say the least. Among them is a full-size chopper, complete with rotor blades, which sleeps four and comes with central heating. The converted 1965 Wessex Search and Rescue helicopter comes with an outside kitchen area and toilet and shower units 50 metres away. Gypsy caravans may be nothing new in the world of glamping, but White Horse Gypsy Caravan still deserves a place on our unique list. Based at Kate's Cottage in Wiltshire but roaming various routes, this amazing experience offers you the chance not only to camp in a comfortable and traditional wagon but also travel around the county, as a gorgeous white horse takes you through the countryside, sleeping at various points along the way! Nestled in what was once an orchard, The Old Apple Shed is exactly as the name suggests; an apple store left over from the early 1970s. From outside it still has an obviously rustic feel but within, this converted pad has a surprising amount of space. There’s a double bedroom with en suite faciltiies, a living area, a kitchen and a dining room, while quirky cabinets made out of old apple crates show the considered touches put into its creation. On the shores of the North Sea, less than an hour from Edinburgh, Harvest Moon Holidays has a stunningly wild and rural feel, with sheep and chickens outnumbering campers and a quirky campsite shop found in the belly of an old Atlantic trawler. In one half of the glamping site seven tree houses are pushed among the tall evergreens (kitted with several bedrooms, kitchens… the works) and before them spreads the seemingly endless sands of Scoughall beach. Ever fancied spending a night on the set of Little House on the Prairie? Visit Tiny Wooden House and you can’t help but think of the classic US show. Inspired by a desire to create miniature, ergonomic architecture, each tiny wooden house offers all the comforts of a normal two-bedroom house, but with a truly tiny footprint. Step inside and you’ll find bedrooms, a kitchen and a separate bathroom while the veranda reveals splendid Warwickshire views. Walcot Hall is not only home to one of Britain’s finest arboretums – including the country's largest Douglas Fir tree planted in 1842 – but also hosts an eclectic mix of luxury glamping options. The most unusual of the lot though, is the converted fire truck. Surrounded by rhododendrons and only accessible on foot, the truck features a brass double bed, old wine crate tables and vintage style lanterns, while the nearby shower is fitted in a genuine vintage AA van. Want that half-way compromise between camping and a cottage? Alongside their already quirky Dandy Glamping offering, several old stables at Farrs Meadow in Dorset have been tastefully revamped in an honest yet elegant style to provide precisely that. They have a slightly sea-side feel, with a host of ramshackle decor giving an effortlessly magical and unpretentious charm. To top it off the showers, a short walk away, are also housed in converted horseboxes with washing up sinks in deep metal troughs!